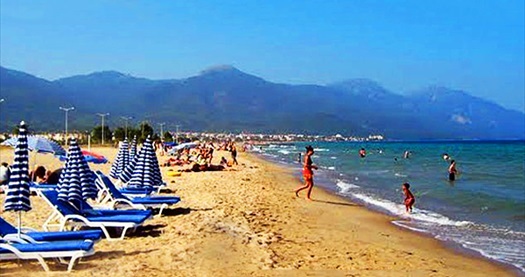 Kusadasi is a very popular resort town Located in the Ayden province of Aegean turkey. It is filled with luxury hotels and holiday flats which cater huge number tourists in its high season. In ancient times, there were three gates to the city, out of which one remains today and forms the glorious city walls of kusadasi. A sight to behold, this spot garners millions of tourists every year. Surrounded with beautiful beaches from both northern and southern directions, kusadasi is ideal for water sports. Various beaches such as the long beach and lost in paradise beach are entirely commercial and filled with various restaurants, cafés and hotels for visitors. Shopaholics have their very own piece of paradise in the form of downtown, which is located near the water front. The area is highly modern and perfect for shopping with many stores an open air bazaars. The variety of fine jewelry and Turkish rugs available are very wide and extremely popular. The mosaic rugs are greatly demanded by tourists and are quite the main attraction of this market place. Of course, there will be a need for bargaining, in case you wish to buy one of these items. Food spots such as avlu are very well known for delicious Turkish food at reasonable prices. TheTurkish coffee is also a specialty at this particular restaurant. Orient and SWE are other restaurants, which cater mouth watering dishes in a cozy and comfortable atmosphere, including old music and top view of the beach. For those who appreciate an extended round of booze, the Limon bar and cem’s paradise are exactly what you are looking for. With a relaxed and fun filled environment, these spots are open overnight all over the year. If you plan to stay at hotel panorama, you are in for a mega treat, involving cheap rates, welcoming staff, luxurious rooms and over all adequacy. The event nights are an added bonus filled with belly dancing and Turkish spoon performances along with drinks. Other hotels such as Dias, suer and sezgin too, are extremely convenient and luxurious, offering all the commodities that you could ask for. Filled with fun and frolic, kusadasi is the perfect tourist destination for those, who wish for a happening holiday along with a bit of peace and tranquility of beaches. the ultimate tourism heaven, this place has to be in your list for the places to be visited in the next vacations, otherwise, you are definitely missing out.